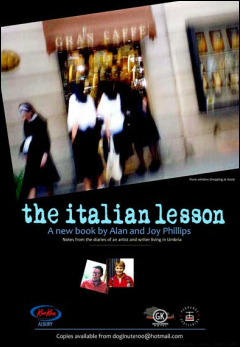 Alan has written, designed and published two books: Two Horizons and The Italian Lesson. This is the story of John Francis and his grandson, Arthur – one transported for life for attempting to assassinate Queen Victoria and the other who gave his life for King and country in the Great War of 1914-18. Alan has researched these family stories (John Francis is Alan’s great great grandfather) to understand how colonial policies and global events affected and afflicted these two young men and their families. Alan and his wife Joy have collaborated on this book of reflections on their time in Italy, where they immersed themselves in language, culture and especially, landscape. Included are many of the large drawings he completed in Umbria, as well as wry observations from his journal on everyday life there. Joy’s writing focuses on recording how the seasons impacted on life in a small rural village. She also quietly observed the creative process as Alan found his artistic Italian voice.